Russia traditionally celebrates the raising day of the elite airborne infantry division or VDV (‘Vozdushno-desantnye voyska’) which, in early August this year, celebrates its 85th birthday. The VDV paratroopers still gets assigned the most complex combat missions, its landing troops regularly receive new and modern equipment and weapons, while the corps itself has undergone major changes in recent years. What is VDV today? The VDV in Russia is considered military elite, the best trained and combat-ready units and formations in the armed forces. They have the status of a mobile reserve corps of Russia’s Supreme Commander. The military command has always paid special attention to the landing troops: they have always had the most advanced weapons and equipment, its officers are paid a higher allowance and the best recruits are commissioned to the airborne corps. VDV's motto, “Nobody but us” celebrates this very elite stature. Today VDV is the core of the newly created Rapid Reaction Force. Given the geographic extent of the territory of Russia, VDV can quickly (in no more than a day) create and build mobile groups in threatened areas. 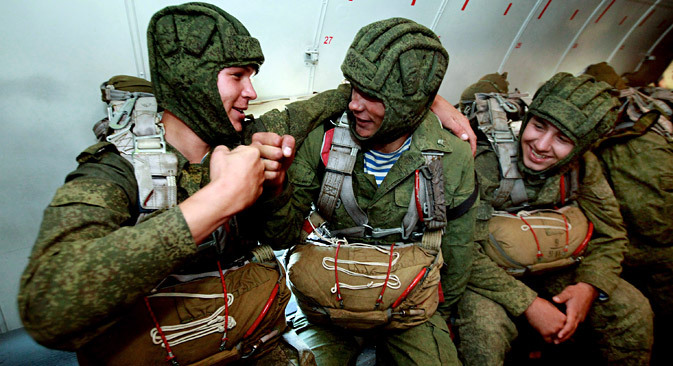 Russian Airborne Troops are formed with over 10 airborne and air assault battalions. Today Russian landing forces have gained extensive experience of combat-trainer operations in the Arctic. The geography of the combat and training tasks performed by the troops covers Novaya Zemlya, Kola Peninsula, Franz Josef Land. This year for the first time in the history of this corps a group of paratroopers landed on a drifting ice floe, to demonstrate its readiness to carry out tasks in the harsh conditions of the North. In tandem with the continuous upgrading of their combat training, rearmament of the “flying infantry” is on in full swing. The VDV will get more than 1,500 new combat vehicles BMD-4M, over 2,500 armoured vehicles ‘Rakushka,’ in various modifications, and self-propelled guns ‘Sprut-SD,’ before 2025. The latest equipment can be parachuted from aircraft, along with the crew inside, directly to the rear of enemy positions, overcome water obstacles, disembark from landing ships in the surf zone and immediately engage in battle with the enemy. Equipment tests in the army are showing good results and preparation for serial production is underway. Paratrooper novelties were demonstrated to the general public at the May 9th ‘Victory Day’ parade. All VDV units are equipped with assault drones which serve as the ‘eyes’ and ‘ears’ of the landing forces, carrying out reconnaissance, patrolling and targeting. The mobility and combat capability of the VDV as a Rapid Reaction Force directly depends on the condition of the military transport aircraft, so substantial enhancement of their capabilities is scheduled between 2018 and 2020. The Ministry of Defence will buy heavy transport aircraft, IL-476, which can deliver men and equipment directly to the area of combat operations. Under the Command’s new plans, it should become possible to transport not just a regiment, but an entire division in this aircraft. “We plan to further increase the combat potential of our troops as well as broaden the zones of their presence even outside of our state,” VDV Commander Vladimir Shamanov said. The challenge the VDV command is gradually facing, of constantly providing the paratroopers with cutting edge equipment, has become more pressing in view of recent events in Ukraine. NATO has decided to revive the rapid reaction force in Europe, locating them as close as possible to Russian borders. Under these conditions, the Russian military command’s moves to raise capacity of the combat-ready ‘mobile component’ seems logical and, indeed, necessary. Russia no longer has anything like the Western group of the Soviet troops and is unlikely to acquire them in the near future, hence, to combat terrorism and to stall NATO moves, the stakes will be raised for the specially trained mobile paratrooper units, capable of constant readiness and able to provide a symmetrical response to increased threats to Russian national security.